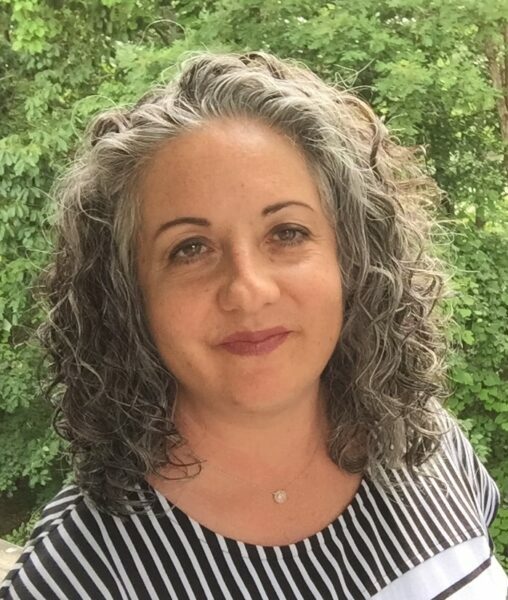 Hey again, fellow Daisies! 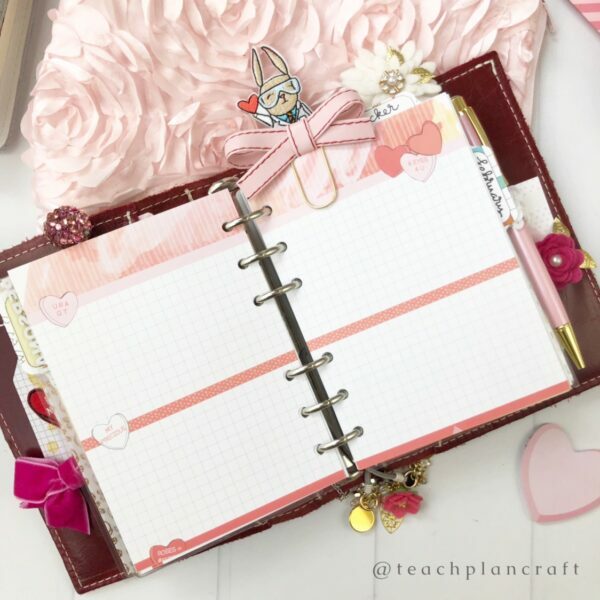 I am back today, this time to share with you my February 2019 planner setup! 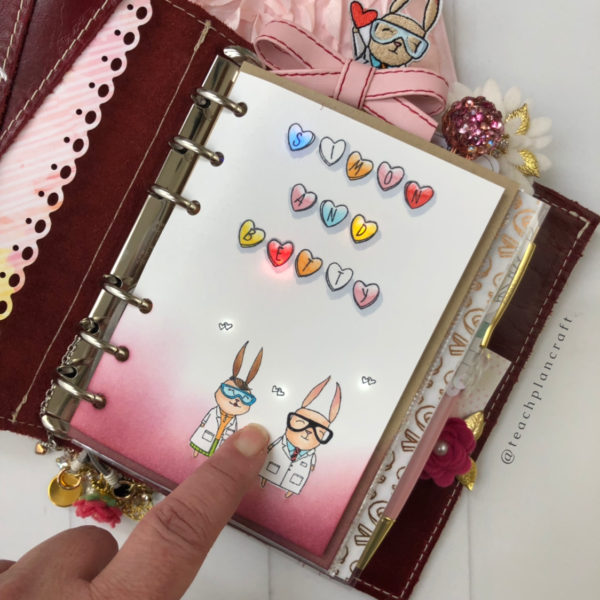 I’ve got some photos of my favorite elements and a link to a video that shows all my planners and accessories for this month, plus a tutorial for making a light-up dashboard. Let’s get started! 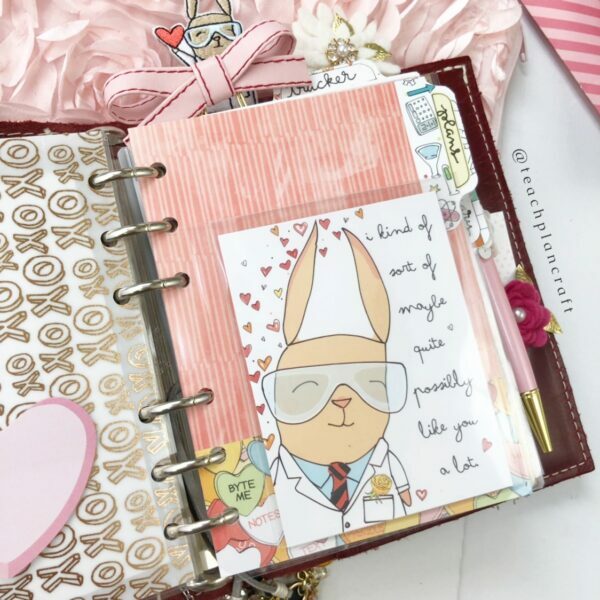 I have been DYING to use this A6 ring Foxy Fix planner in Chili leather, and February’s pink color scheme is just perfect for it. I love the deep tone and how it sets off the lighter colors in the kit. As always, the first thing in my planner is a cover art piece I create each month from the back of the Standard Dori booklet and elements from the kit. This month, I made a light-up dashboard using a Chibitronics light kit. I left this photo a bit dark so you could easily see the lights – isn’t it cute? It was so easy to do! My February video, linked down below, has a tutorial on how I did this. Behind my front art piece is Simon – my dear friend and fellow Planner Team member Jennifer Crowder (@happyplaceplanning) sent me the clear pocket for him, and now I can always have him front and center! Since the pocket is clear, I can also have a card on the back – although I didn’t take a photo, I’ve got one of the Betty cards on the other side. I LOVE that this kit is chock full of Simon and Betty! For one more piece of decoration, I decided to make my first ever shaker dashboard! I know many of you are probably old hands at this, but this is my first one, and I’m pretty proud of it, lol. 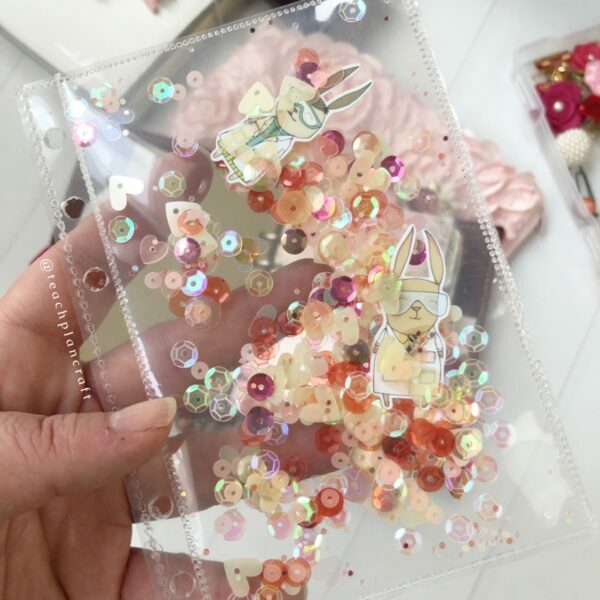 I was so excited to see the pink and holo sequins in the Classified Memory Keeping kit – I knew immediately I wanted to try a shaker dash. I added two of the Simon and Betty die cuts inside – they’re so adorable! When this month is over, I will either hang on to the dashboard as-is or cut it open to save the sequins for another month. They are just so pretty! Now for some function. 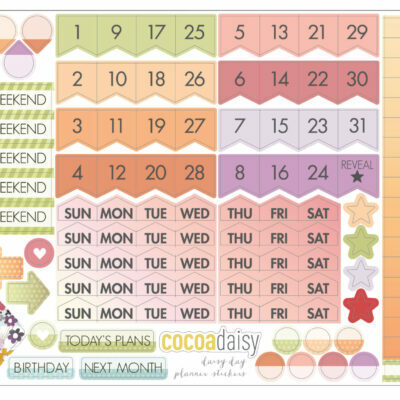 Here, you can see the Standard Dori cut down to A6 size for my daily planning. 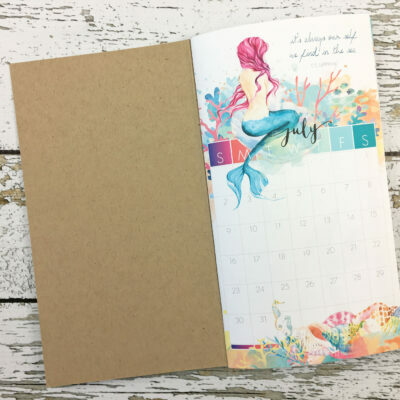 I used to use printable planner pages from another company, since Cocoa Daisy doesn’t have A6 pages, and use this booklet for daily gratitude. 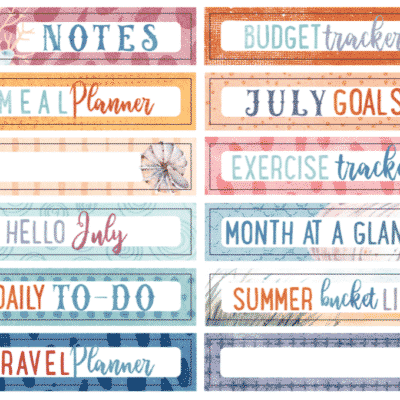 But the release of the TN Memory Keeping kit totally changed all that – now my gratitude is housed in the TNMK, freeing up this Dori booklet for actual planning, and I love it! I’m showing you this page blank so you can see how cutting it affects the design and artwork. The great thing about going from Standard to A6 is that I can cut from either the top or the bottom, depending on where the artwork is placed, and still be able to use two full sections for planning. Now for two more accessories I’m so happy to have this month! 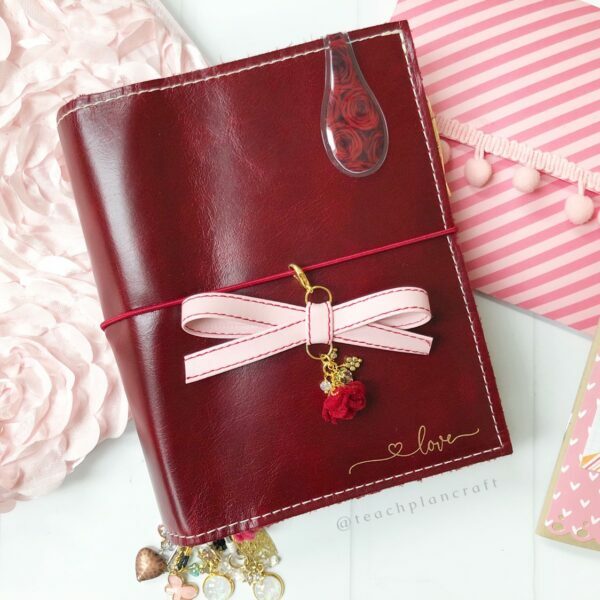 First, I am in love with this pen design; although Cocoa Daisy has released lots of pens, this is only the second one in this design (the first was in January), and I’m thrilled to see another one coming in the March kit. This has quickly become my absolute favorite pen to write with, and I LOVE the dark and light color scheme with the gold metal. 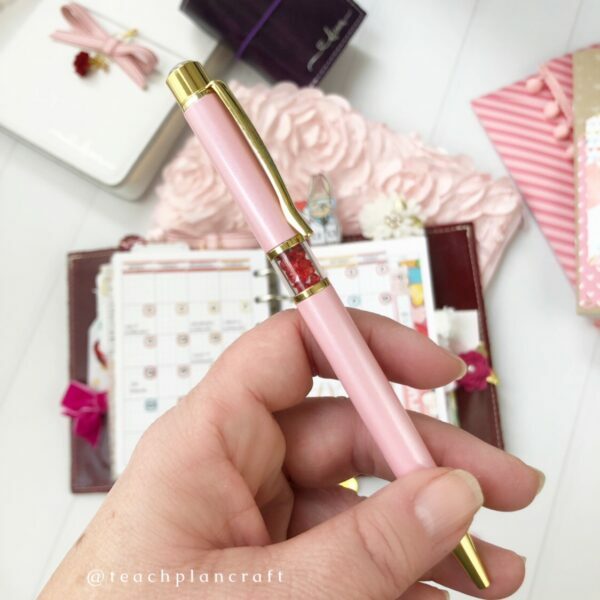 I couldn’t have asked for a better-coordinating pen this month if I had designed it myself! 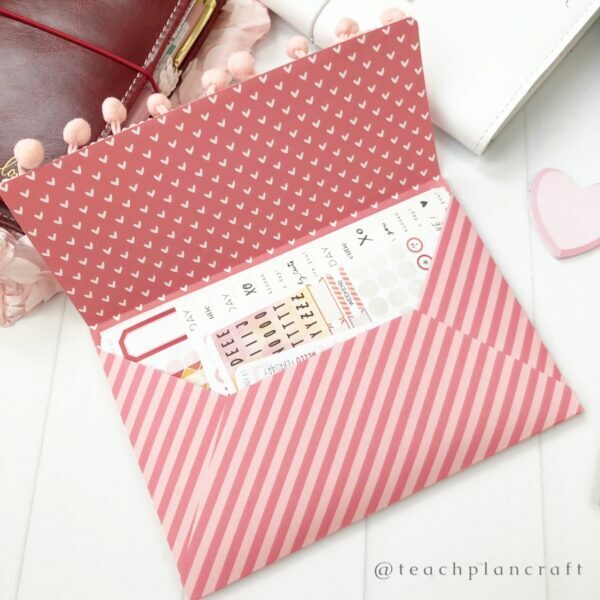 Here is a complete flip-through of this planner, my teacher bullet journal, my wallet, and my clips and accessories (plus the light-up dashboard tutorial).